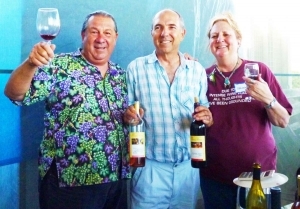 Organized by Johnny and Shirley Schwaesdall, owners of the oldest winery in Ramona, the tour has been a popular attraction since its inception ten years ago. At the time, their vision of transforming East County into a wine region with a stellar reputation was little more than a dream. Today, Ramona has a federal appellation as a wine-growing region, now with 15 wineries and 9 tasting rooms. 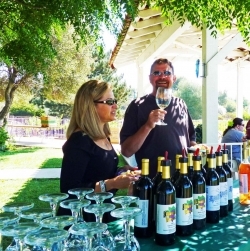 Winning awards in prominent wine-tasting competitions, several local wineries are earning national and international praise –and boosting the tourism value of East County’s growing winemaking avocation. We tasted samples of both Schwaesdall and Ramona Winery labels. The former is made entirely from local grapes—including some old-growth vines dating to the 1950s. The soil and climate here are similar to that found in the Rhone Valley of France or Sonoma, California, according to the Schwaesdall’s website. 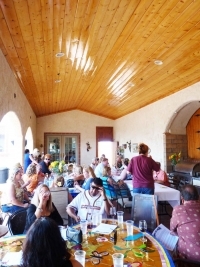 Tastings began with whites (Chardonnay, Sauvignon Blanc and a fruity white Zinfandel) and progressed to some hearty reds, including bronze and gold medal winners in the Temecula Wine Competition. Schwaesdall also makes a port that is rich with flavors of currents and pairs particularly well with chocolate. 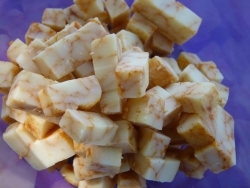 While at Schwaesdall, we also savored an array of tasty cheeses from Bravo Farms, including such savory varieties as chipotle, sage, and cranberry. Filled with cheer, passengers piled into a chartered bus, where classic rock ‘n’ roll tunes from bygone decades put everyone in a festive mood. One of the passengers pointed out property he bought recently in Ramona, with plans to become the 16th vintner in town and dreams of creating a Wild West town complete with a working train for visitors. After a journey through rolling foothills in the summer sun, we stopped at La Serenissima in Sunshine Summit near Warner Springs. http://www.vinotiso.com/ Vintner Tony Tiso provided a tour of the winery, where the high altitude, climate and mineral-rich rocky soil are similar to that found in Italy, where his winemaking family has its origins. “Our wines are drier, unfiltered, and deeper in color,” he explained. The winery includes varietals such as syrah, as well as blends of multiple reds for which East County’s climate is idyllically suited. He also makes some white wines and coming soon, will be adding Pinot Grigio grapes. We sampled five wines, from a white Arneis to Cabernet Franc and Merlot. Tiso also makes a Spanish Tempranillo, though it was not among those on the tasting menu this time. 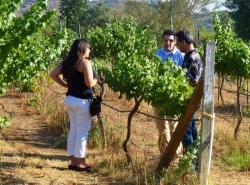 Utilizing sustainable farming (no pesticides or chemical fertilizers, with minimal water) and traditional winemaking methods, he produces wines that are both unique and pleasing to the palatte. Some have an earthy flavor, reflecting the absorption of minerals from the rich granite soil under low water conditions. All grapes are grown on site at the 10-acre estate. A tour of the winery provides details on processes such as fining (a clarification process using egg whites) and ends in the subterranean barrel room—or what Tiso refers to as “my office.” Each type of oak (French, Hungarian, American) imparts its own flavor to the wine. 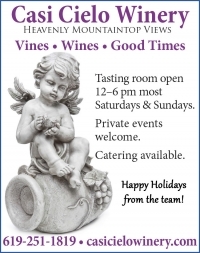 Tastings here are normally by appointment only, so be sure to call ahead—but it’s well worth the trip. Country Inn Catering from Ramona provided a barbecued lunch complete with slow-roasted tri-tip, chicken, salad and deliciously spiced beans that lived up to their billing as they best beans anyplace, ever. Back aboard the bus, we listened to Spanish guitar music that set a romantic mood as we headed off to the aptly the aptly-named Milagro Farm Vineyards www.milagrofarmvineyards.com. Milagro means “miracle” in Spanish. 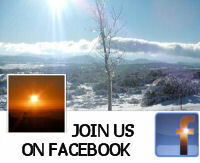 Located just off Highway 78 in Ramona (behind the Oasis Camel Dairy) , the winery is owned by Kit Sickels. The property’s prior owner never found water, but after buying the land, Sickels drilled deeper and stuck the equivalent of local gold in this arid region: water. He bought the property 13 years ago and bottled his first wines in 2006. In November 2011, he opened a spacious tasting room with comfy leather couch and rocking chair, as well as a patio on which to while away an afternoon. After losing their home to wildfire, the family opted to not only rebuild, but plant more vines. Today, the vineyard includes 19 planted acres on the 110 acre property, where some vines date back to 1985. 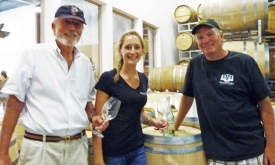 Winemaker Jim Hart learned his craft at his family’s Hart Winery in Temecula. “I have a wine making certificate from U.C. 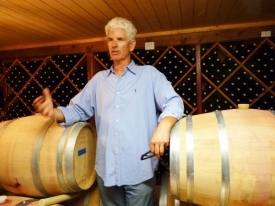 Davis, but most of my winemaking skills I attribute to my father,” he said. The wine ry has an impressive list of awards and most recently beat out the French with a Sauvignon Blanc in head-to-head competition. The vineyard produces a variety of fine reds and white wines. My personal favorite, however, was Raggio Rossa—named for the vintner’s wife. “She said if I was going to name a wine after her, it had to be aged in French oak barrels,” Sickels told us with a smile. Wrapping up our tour, we stopped at Lenora Winery www.lenorawinery.com. 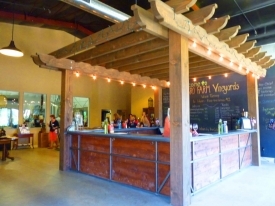 Owner Eric Metz recently purchased the winery after the original owner died. The tasting room is in an outdoor tent, where Metz poured a variety of wines to sample. There is also an outdoor picnic area beneath a shaded grape arbor. 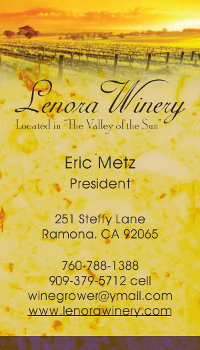 Lenora produces primarily red wines, but also offers an affordably-priced Chardonnay. An unusual feature was the offering of dessert wines; a Ruby Angelica provided a sweet ending to a delightful day. If you missed the tour, there’s always next year---or you head south of the border for an October tour of Mexico’s Guadalupe winegrowing region that the Schwaesdalls are planning next. For details, visit their website at www.schwaesdallwinery.com. They also have summer events at the winery, where feasts range from paella to pizza cooked up in an outdoor oven. Meanwhile, you can visit the wineries listed above, or visit the Ramona Valley Vineyards Association http://www.ramonavalleyvineyards.org / or San Diego Vintners Association http://sandiegowinecountry.wordpress.com/ to discover even more wonderful wineries in our region.